Empty tank? We'll fill it for you! Whether you need gas delivery or a battery jump, Temecula Tow Company takes pride in meeting your 24-hour roadside assistance requests. If you need help getting your non-working vehicle off the street or highway, our drivers are more than happy to help. We make sure that our Temecula roadside assistance rates are competitive. Our team provides proficient service, dedicating ourselves to giving every vehicle and its owner a safe and prompt experience. Unlike the service offered by other Temecula towing companies, you never have to worry about waiting for the roadside help you need. We always have trucks on standby, so that a brief wait to get to your location is more than correct. 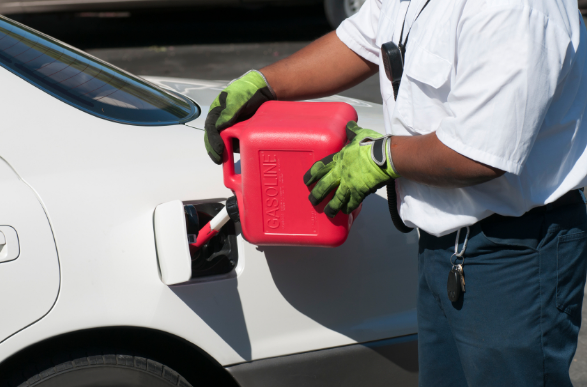 Contact Temecula Tow Company today for fuel delivery service to ensure you get gas in your vehicle in no time! We have been the best towing, auto lockout, fuel delivery, brake repair, and tire changing company in Temecula, California. We offer roadside assistance for vehicles of any size, make, and model. We want you to think of us as your #1 source for all your auto assistance services. For 37 years, we have acquired hundreds of satisfied customers. Our company was founded on honesty. We always strive to hire the best individuals and give the most effective workmanship. If you let us manage your issue, our intention is to do all we can to ensure you get the utmost level of professionalism. Our reputation in the Temecula community depends on it. The main thing about us you need to remember is that our team takes great pride in their work. We want to make vehicles the best repaired and maintained in Temecula, CA. With our know-how and proficiency, along with advanced, cutting-edge methodologies, we make this concept a reality with each job we undertake. As the leading towing contractor in Temecula, we provide a complete line of road assistance and towing work for any and all vehicles. We know how important it is to feel comfortable in your car or truck, not to mention feeling comfortable while driving among the Temecula streets and highways. We know you appreciate decency and trustworthiness in your towing contractor. When you need gas to get to you in a hurry, our towing team completes the job in a timely fashion. We are only happy when you are. When your car or truck needs first aid, we are just a call away. We are at your location quickly, regardless if it is 12 noon or 12 am. If you ever find yourself in need of any other type of roadside help, including battery jumps, flat tire changes, or towing, come back to us. We are proud of the value-driven resolutions we deliver. Furthermore, we are proud of the standing we have acquired with Temecula, CA vehicle owners as a dependable roadside assistance and towing business that appreciates its customer relationships above all else. You will be astonished at our low-cost gas delivery estimates that will get you back on the road in no time. If you want a Temecula, CA towing contractor who gives quality roadside assistance service, choose Temecula Tow Company.